Qualitative analysis for stability of some hydrogen bonded interpolymer complexes of poly (acrylic acid) with non ionic polymers such as poly (methacryl amide) (PMAm), poly (vinyl pyrrolidon) (PVP), poly (ethylene oxide) (PEO) and poly (ethylene glycol) (PEG), has been done by determining the stability constant (K) and thermodynamic parameters (e.g. ΔH0 and ΔS0) of these complexes at several temperatures. The comparative studies indicate considerable difference in the values of these parameters. They can be explained on the basis of influence of other interacting forces such as hydrophobic and ion dipole interactions during interpolymer complex formation. It has been found that the stability of Hbonding interpolymer complex is greatly enhanced by these two factors. 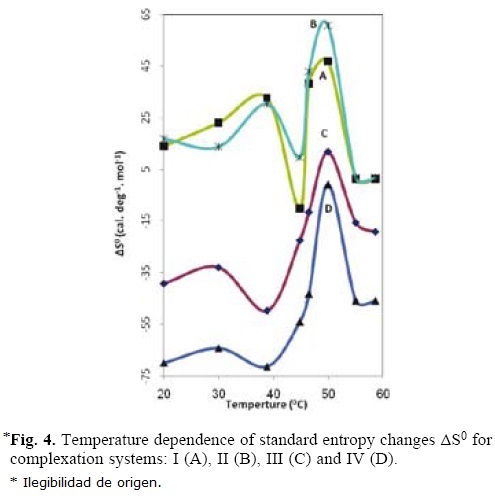 Key words: Thermodynamic parameters, Interpolymer complex, Stability Constant, Hbonding, degree of linkage. El análisis cualitativo para determinar la estabilidad en la unión de hidrógeno interpolimérico de complejos de poli (ácido acrílico) con polímeros no iónicos como poli (metacril amida) (PMAm), poli (vinil pirrolidona) (PVP), poli (óxido de etileno) (PEO) y poli (etilen glicol) (PEG), ha sido llevado a cabo mediante la determinación de la constante de estabilidad (K) y los parámetros termodinámicos (e. g. ΔH0 y ΔS0) de los complejos a varias temperaturas. Los estudios comparativos indican diferencias significativas en los valores de los parámetros. Ello puede ser explicado por la influencia de otras fuerzas de interacción como son las interacciones hidrofóbicas e ión dipolo durante la formación del complejo interpolimérico. Se ha encontrado que la estabilidad de complejo es aumentado enormemente por esos dos factores. Palabras clave: Parámetros termodinámicos, complejo interpolimérico, constante de estabilidad, uniónH, grado de unión. Hydrogenbonding is one of the most important forces responsible for selfassembling of biological macromolecules. It also plays an important role in the selfassembling of synthetic polymers in aqueous solutions [16]. Since synthetic polymers have simpler structure than biopolymers, the functional phenomena occurring in complicated reaction in living cells may be more easily understood by investigation of synthetic polymer interaction as a model composed of comparatively simple polymer [24, 6, 7]. Interpolymer complexes stabilized by hydrogen bonding have attracted much attention not only because they mimic the biological systems, but also because they present interesting solution and solid state properties, used in a wide range of technological application such as drug carriers, in which advantage is taken of their controlled release capabilities [817], biological substrates, biosensors, light emitting diodes, etc. [15, 22, 23]. The concept of interpolymer complexation by hydrogen bonding has also been succefully used in construction of polymeric micelles [1821]. Among the complexes formed by Hbonding between synthetic polymers the complexes formed between poly (carboxylic acid) like poly (acrylic acid) (PAA) or poly (methacrylic acid) (PMA) and nonionic proton accepting polymers e.g. poly (ethylene glycol) (PEG), poly (methacryl amide) (PMAm), poly (vinyl pyrrolidon) (PVP) and poly (ethylene oxide) (PEO) are the most studied ones. The complex formation in such system is controlled by several critical factors such as solvent nature [17, 24], critical pH of complexation [4, 2529], minimal molecular weight [16, 22, 30], minimal amount of active group sequence [2, 4, 22, 25], temperature etc [2, 4, 2628]. In additional, Hbonding interpolymer complexes may be stabilized by additional interactions such as hydrophobic interaction in aqueous solution [27, 22, 3133]. It is also known that nonreacting group may drastically change the complexation i.e. if the amount of ionic groups exceeds 10% in a poly acid chain, the interpolymer complexation is prevented [1, 2]. Though considerable amount of work have been reported in the literature regarding the fundamental studies on these types of interpolymer complexes and their applications, but the information has been mostly of qualitative nature because of lack of a suitable theory for interpretation of experimental observations. The main aim of this research work is to analyze more qualitatively the process of complexation of above mentioned Hbonded interpolymer complex systems. These are interesting in view of the fact that the interaction of poly (carboxylic acid) with PVP and PMAm not only involve Hbonding but also ion dipole interaction [2, 7, 33]. In addition hydrophobic interactions play a significant role in the stability of polyacidPVP complex [24, 7]. It is also known that PEO and PEG both refer to polymer of ethylene oxide which differs only in molecular mass. PEO refer to polymer with high molecular weight and PEG to polymer with lower molecular weight. These two polymers have different physical properties and applications. The stable complexes can form only when molecular weight of interacting polymer is larger than a critical value [12, 4]. In this investigation efforts have been made to compare the corresponding values of thermodynamic parameters (e.g. ΔH0 and ΔS0) and their relation to stability of these interpolymer complexes. It is known that proton accepting polymer and proton donating polymer typically interact with each other in aqueous medium and organic solvents almost stoichiometrically [17]. This complex formation is affected by temperature, polymer structure, polymer concentration, solvent and other interaction forces e.g. hydrophobic interactions. In general the ratio [protonaccepting polymer units]/[protondonating polymer units] in mol/L of the complex is almost unity in dilute solution, and 2/3 in concentrated solution [17]. Keeping this in mind in order to investigate more qualitatively the relative stability of the above hydrogenbonded interpolymer complexes several two component interpolymer complexes have been prepared by mixing PAA, with stoichiometric quantities of PVP, PEO, PEG and PMAm (1:1 unit molar ratio) in aqueous solution. Where [H+] and [H+]0 are proton concentrations of poly carboxylic acid solution in the presence and absence of the complementary protonaccepting polymer respectively. Where C0 is the initial concentration of poly carboxylic acid (unit mol/L) [7, 31, 32, 34, 35]. 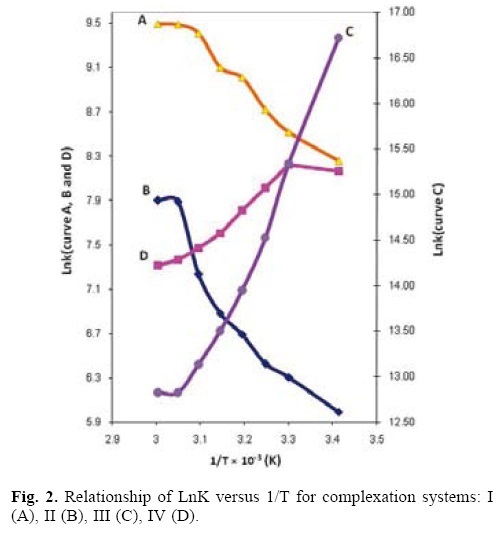 The values of LnK for complexation systems I, II, III and IV are presented in table 1. 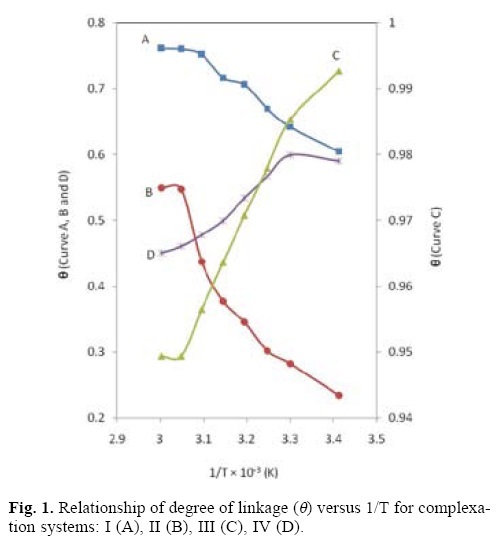 The corresponding plots of degree of linkage and LnK versus reciprocal of temperature for systems IIV are shown in figs. 1 and 2 respectively. It can be seen from the figures that the complexation system I and II (i.e. PAAPVP and PAAPMAm) showed an increase in LnK with increase in temperature (CF. curve A, B in figure 2). However in case of system III (i.e. PAAPEO), there is an initial increase in LnK with increase in temperature and then there is continuous fall after that (CF. curve D in figure 2). It also shown that the relative stability of system I is much greater compared to system II. This trend could be anticipated in view of the fact that in system I and II interaction of reacting units involves not only through hydrogen bonds but also through ion dipole interaction between the partially protonated amide groups of PMAm and PVP with the C=O dipoles of carboxyl group of PAA [17]. The higher stability of system I as compare to system II, also system III to system IV are due to reinforcement of hydrophobic interaction. Presence of strong hydrophobic interaction in PAAPVP complex system was studied by many authors [4, 7, 22, 33]. Staikos  used steadystate and timeresolved fluorescence measurements to study the contribution of hydrophobic interactions to the stabilization of some Hbonded interpolymer complexes between PAA and one of the four following polymers: poly (Nisopropyl acryl amide), (PNIPAAm); poly (methacryl amide), (PMAm); poly (vinyl methyl ether), (PVME); and poly (ethylene glycol) (PEG). From the results obtained he concluded that PNIPAAm/PAA and PVME/PAA interpolymer complexes demonstrate a strong hydrophobic character; that the PEG/PAA complex demonstrate only a limited hydrophobicity and that the PMAm/PAA complex is not at all hydrophobic. The stability constant (K) can be used to calculate the thermodynamic parameters (e.g. ΔG0, ΔH0 and ΔS0) for the complexation system IIV from its temperature dependence by using following relationships [2, 4, 7, 24, 34, 35]. Where ΔG0 is the change in standard free energy for complexation and (R) is the molar gas constant. The maxima values for all systems are tabulated in table 2. 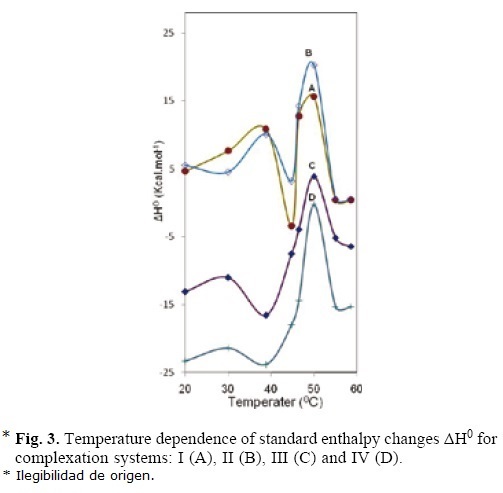 The net enthalpy change ΔH0 and overall change in entropy ΔS0 for complexation system (I to IV) have been calculated on the basis of the above equations at several temperature and the corresponding plots are depicted in figures 34 respectively. and the temperatures at which AH1 and AS1 are observed is at 40 °C for system I and II, at 30 °C for system III and IV. The second maxima for all the system IIV are observed at 50 °C. The two different trends observed for the two maxima in ΔH0 and ΔS0 are obviously related to the difference in the nature of interaction involved in the two pairs of reacting units for each system. It should be noted that the net enthalpy change (ΔHM) during interpolymer complex formation consists of at least three steps, namely (1)desolvation (2)complex formation by hydrogen bonding or ion dipole interaction and (3) conformational change involving complex formation therefore, the overall change in ΔH0 and ΔS0 are the sum of these contributions [2, 7, 24, 34, 35]. Since the contribution to each step will be different for the various systems, different values for AHM are understandable. The relative higher value of ΔH0 and ΔS0 for system I compared to system II may be attributed to the relatively higher proportion of ion dipole and hydrophobic interaction and possibly release of more solvated molecule during complexation (CF. curve A and B (first maxima)). The abrupt fall observed after the first maxima with increase in temperature are due to destabilization of hydrogen bond which results in weak cooperatively between binding sites. As can be seen from the figures 3 and 4 at higher temperature the contribution due to conformational change towards ΔH0 and ΔS0 is more in the case of system II (PAAPMAm) as compared to system I, because the (PAAPVP) complex system contains more hydrophobic interaction which plays a significant role at higher temperature (CF. curve B and A (second maxima)). It can be concluded the presence of other interacting forces such as hydrophobic and ion dipole interactions during interpolymer complex formation stabilized by Hbonding between PAA and non ionic polymers greatly enhances the stability of its complex. The values of the stability constant (K) and the thermodynamic parameters (e.g. ΔH0 and ΔS0) of the interpolymer complexes of PAA with non ionic polymers (PVP, PMAm, PEO and PEG) depend on the resultant effect of temperature on the several processes (e.g. hydrogen bonding, hydrophobic interactions, ion dipole interactions and thermal motion), which are taking place during complexation between the component polymers. Poly (acrylic acid) (PAA). Poly (acrylic acid) of weight average molecular weight ( ) 2100 Da was procured from Aldrich Chemicals Company. Poly (vinyl pyrrolidone) (PVP). PVP was supplied by Fluka Switzerland in the form of a white powder. The weight average molecular weight ( ) was 24 x 103 Da. Poly (ethylene oxide) (PEO). PEO was supplied by Iwai Kagaru Co Ltd., Japan. Its weight average molecular weight ( ) was 190 x 103 Da. Poly (ethylene glycol)) PEG). Poly (ethylene glycol) of molecular weight 400 Da was obtained from MerckSchuchardt (Munich, Germany). It was found to be 69.3 x 103 Da. Solvent. Double distilled water was used as the solvent for all the measurements. Measurement of pH. The pH measurement of aqueous solution of the polymer or complex was carried out inf a water jacketed cell by ATI ORION pH meter (model 525A), using a combination electrode (ORION pH Triode 9157) with auto calibration for buffers 1.68, 4.01, 7.00 10.01 and 12.46 within a range of ±0.001 pH units. Two points standard calibration was performed at the beginning of each day measurements and also with one standard every two hours to compensate for possible electrode drift. In all experiments the temperature was thermostatically controlled within ±0.05 °C by circulating water through jacketed glass cell, and the sample solution was continuously stirred using a magnetic stirrer. The pH was measured at a polymer concentration of 1 x 103 mol.L1 in the absence and presence of stoichiometric concentration of PVP, PMAm, PEO and PEG. Complexes did not precipitate at this concentration.